Ukip is about to choose a(nother) new leader. Will it be Suzanne Evans or Paul Nuttall? That’s the choice (we can safely discount John Rees-Evans for.. all.. sorts.. of.. reasons..). If the membership gets it right, the party might just rediscover a political purpose. Should they get it wrong, Ukip is toast. Yesterday’s toast, too. After Steven Woolfe’s swipe that the party is in a ‘death spiral‘ (which, let’s face it, is true); and with Nigel Farage rumoured to be knocking at Theresa May’s door, supplicating for a process of re-Toryisation and elevation to the Peerage for services to Independence Day UK (and, of course, to ousting David Cameron), Ukip is a party not only in search of a safe leader but in search of a secure political purpose. Sweeping up disaffected Labour supporters for no particular end is not any kind of dream for very much at all. Far be it for one who inclines toward a Tory view of the world to interfere in the leadership traumas of a competitor party, but democracy suffers when opposition parties are led by donkeys. It suffers even more when they are led by asses who are very good at making nice speeches but doing absolutely nothing about the pressing matters of the day. Political history is littered with politicians who become footnotes, or footnotes to footnotes. Shouting ‘Look at me!’ doesn’t make one known; it makes people ask ‘Who’s that prat?’. And politics attracts an awful lot of prats, for some reason. In the tussles and gripes of shifting power, vaulting ambition and conviction representation, it’s not enough to hope and pray you’ll win the ballot to present a private member’s bill to ban out-of-date crisps. Without a vision, people perish, politics atrophies and Hansard is boring. Ukip needs a leader who grasps the political imperatives and the grievances du jour and is prepared to articulate them cogently – not just for public-service applause, but for a programme of thoughtful, responsible action for the common good. Suzanne Evans understands the ‘common bad’ of community division; that there are some problems which tolerance cannot handle. She understands community ethos, interdependence, fraternity, participation and neighbourly security. You may demur at her prescription for cohesion, but you cannot fault her instincts for reconciliation. Ukip needs a leader who is theologically and religiously literate. Suzanne Evans has a degree in Religious Studies which, for some, would be a qualification in irrelevance. But we live in a growing global web of interaction where religion is a thread which increasingly transcends national boundaries –for good and ill. Islamism is at our door: it even sleeps amongst us. We are losing our ancient Christian liberties because ‘extremists’ are now all those for whom faith in God is more important than the rule of law. Most politicians focus on important matters of trade, finance, mass communications, the environment, poverty, education, health… Suzanne Evans can look at all these affairs through the inescapable lens of religion and the interaction of cultures. We won’t attain the good life or win freedom until we grasp the origins of goodness and the meaning of that freedom. It is useful to have politicians who understand the imperative of self-determination and the triumph of human liberty. Ukip needs a leader with charisma, intelligence, eloquence and considerable media experience; one who is able to speak to the whole country. It’s not enough to have a parochial appeal ‘to the North’, as though Labour’s disaffected supporters can offer a viable path to anywhere soon. They may be good people, with sound moral instincts and laudable dreams of patriotic purpose, but it is a shallow vision which preys on anti-Corbyn cynicism rather than inspiring for a common endeavour of goodness. The needs and goals which enhance human relationship are the ones which Suzanne Evans seeks to prioritise. What are they? Well, we could be trite and convenient, but the depth of apprehension is in the mind of the woman. She grasps that many of the goods and bads of life arise within different forms of human interconnection. You may seek a simple normative framework: real life is messy, and people are complicated. Ukip needs a leader who understands the party’s dark side and where its poisonous culture needs to change. Suzanne Evans has been laughed at, sneered at, sidelined, ignored, misrepresented and suspended by individuals in her own party, but still she soldiers on for the cause of freedom. There’s loyalty for you. And there’s conviction and determination. You want steel? Look into her eyes. After being hurt, most people become angry or they flounce out of wherever. Politicians do it in the hope of making a newspaper headline. A few will redirect their exasperation and refocus their energies to become a moral force for good. Suzanne Evans understands the nature of evil and confronts it. Ukip needs a leader who embraces ethical strategy and political diplomacy for social progress (which some might term regress). There’s no point hankering after ‘the good old days’: society changes and the world moves on. Suzanne Evans is an agent of change. If Ukip is to rise above its intense internal conflicts and imminent political irrelevance, it needs a leader who can provide the opportunity to reconsider the new context in the perspectives of inherited traditions and a changing public theology. 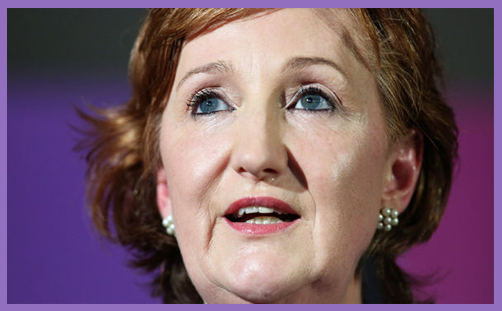 Suzanne Evans wants to move Ukip beyond solitary confinement and fringe politicking to consider wider judgments of social practices and political institutions for the shared common good. For her, that means freedom from tyranny, oppression and poverty: it means a revitalisation of democracy, freedom for captives and the flourishing of humanity. She wants to secure freedom, sustain freedom and propagate freedom, understanding fully that human freedom is never a solitary possession but one of communal give-and-take. This is a bold vision, and it is good. You might even call it ‘Christian’.